The Texas Rangers had been on the border with Mexico for almost a century at the time of World War I. In 1910 Mexico erupted into revolution. Rebel bands in northern Mexico fought the Mexican Army and each other. Gunrunning from the United States and raids and rustling from Mexico increased all along the border. Revolutionaries retreating from Mexican Federal forces often fled across the Rio Grande. This Bandit War taxed the Texas Rangers’ small numbers, even after the U.S. Army joined them along the Rio Grande to counter the raids. German arms shipments to Mexico continued after the Revolution started; suspicions of deeper German involvement in Mexico grew after World War I began in August 1914. After the United States entered World War I in 1917, the Texas Rangers expanded to twelve companies. Although Rangers were called away to duties throughout the state, most were needed along the Border, where the pursuit of draft evaders trying to cross the Rio Grande joined the Rangers’ pre-war duties. The end of World War I in November 1918 had little effect on the Rangers’ work on the border. The pace of operations slowed when the Mexican Revolution finally ended in 1920, but the banditry, cattle rustling, and smuggling did not stop. The Texas Rangers had been on the border for almost a century when World War I started. They are still on the border, facing many of the same challenges, a century later. In 1901, the Texas Rangers were reorganized into four companies. Besides their normal law enforcement duties, the Rangers also dealt with bandit depredations on isolated ranches, sabotage against irrigation stations and the railroads, liquor smuggling and possible invasion from Mexico during the Mexican Revolution and World War I. The Plan de San Diego (1915), an alleged plot for Mexico to reclaim portions of the southwestern United States, added to an already tense atmosphere by creating distrust among some residents along the Texas-Mexico border. Revolutionary activity spread across the border into Texas where the Rangers worked to protect life and property. For almost a century, the Rangers’ primary mode of transportation was the horse. Even into the 1930s, Rangers continued to provide their own mounts as needed. Where roads were poor or nonexistent, the horse and pack mule were necessary tools. Both the railroad and automobiles offered Rangers greater mobility. They were issued railroad passes which allowed them to travel free on most trains. Until the 1940s, the State did not provide Rangers with vehicles. In 1919, the state legislature did provide Ranger Companies fifty dollars per month for maintenance of private cars used for Ranger business. While border unrest was still a problem, in the 1920s and 1930s Rangers in other parts of the state dealt with a variety of situations including, civil unrest, labor strikes, Ku Klux Klan activity, political corruption, bootlegging, gambling and the oil boom. Civil unrest came in many forms in the 1920s and 1930s. When conditions became violent or local law enforcement was inadequate, martial law was sometimes imposed. On a number of occasions, Texas Governors felt the need to declare martial law and send Texas Rangers and the Texas National Guard into turbulent areas. Thousands of people flocked to the Texas oil fields in the first half of the 20th century seeking their fortunes. Tent and shanty towns popped up amid the oil derricks. With gambling, bootlegging, theft and prostitution thriving in these areas, local law enforcement was often no match for the more powerful crime bosses, and were sometimes even involved in the illegal activities themselves. The 18th amendment prohibiting the manufacture, sale, transportation, importation, or exportation of alcohol (bootlegging) went into effect in January 1920. While Rangers stationed on the Texas-Mexico border dealt with liquor smugglers, Rangers in other parts of the state dealt with distillers. Ranger raided businesses and residences known or suspected of alcohol production and distribution. The Rangers seized and destroyed many stills and confiscated thousands of gallons of liquor, between 1920 and 1933, when prohibition was repealed. Bonnie and Clyde had become infamous bank robbers by the spring of 1934. Lee Simmons, Superintendent of the Texas Prison system, hired Frank Hamer, an ex-Texas Ranger, to pursue and capture the pair. They were killed in a bloody shootout on a country road outside Gibsland, Louisiana. A posse of six men was involved in the shootout. Frank Hamer spent 102 days tracking the pair and was the acknowledged leader of the group. Another ex-Ranger named B.M. “Manny” Gault joined Hamer from the Highway Department in April 1934 and traveled with him until the shoot-out. Bob Alcorn and Ted Hinton worked for the Sheriff’s office in Dallas. 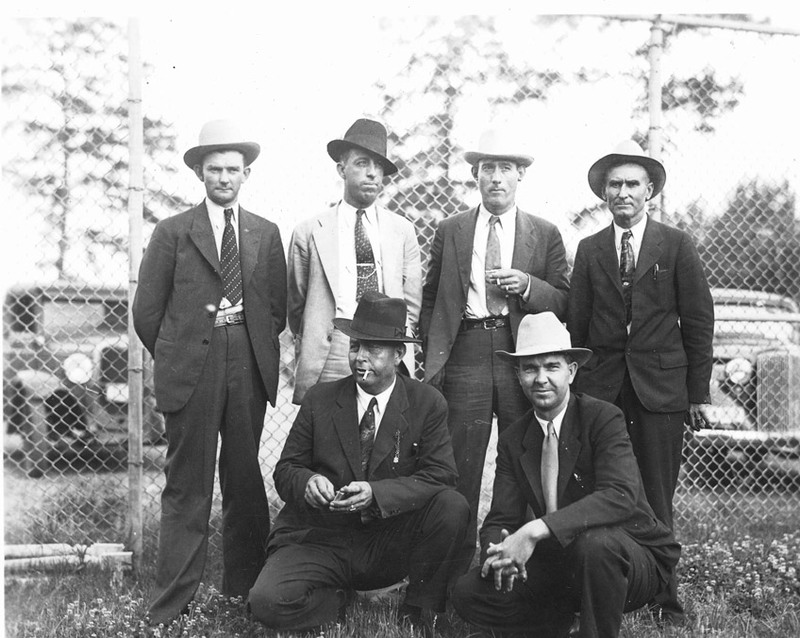 In order to have jurisdiction in Louisiana, Hamer needed local law enforcement to participate in the arrest of Bonnie and Clyde, thus Sheriff Henderson Jordan and Deputy Prentiss Oakley were part of the posse. All of the men had information on Bonnie and Clyde’s movements or had inside information about their whereabouts. The men drove out to a stretch of road outside Gibsland and were hiding in the piney underbrush waiting for the pair to drive by. It is believed by some that they coerced Ivy Methvin, father of Henry Methvin, to pretend his truck had broken down on the side of the road. On the morning of May 23, 1934, Bonnie and Clyde drove up to the site in a Cordoba Gray Ford V-8. As they slowed down, the 6 men stood and opened fire. It was 9:15 in the morning when the shooting started and by 9:20 am the pair was dead. Over 150 shots had been fired and both criminals had been struck multiple times.